But we have only tested for the second and the third cases. Because we are doing line coverage, this sort of coverage issues don't show up. In order to address this, we need to do branch and path coverage. I wrote in the previous article that Xdebug follows all branches to find dead code during code coverage, but it never did really more with that. So, again, I started experimenting through VLD to see how I could get it to list all possible branches (easy) and paths through a function or method. It's a bit difficult to see what goes on here, but in general there are five branches and four paths. 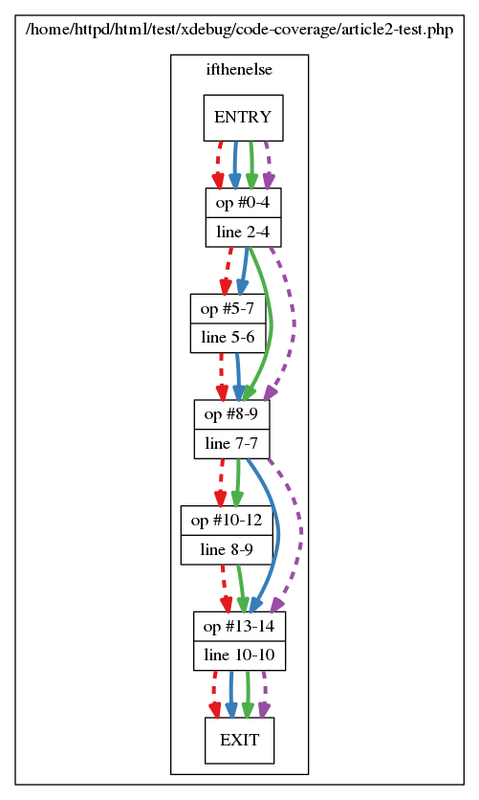 The first two branches (0 and 5) are for the first if statement, the second two branches (8 and 10) are for the second if statement and the last branch (13) is the end of function, with an implicit return to the calling function. Branches are named after the opcode entry that forms the start of a branch. With the functionaly added to VLD, the next step was adding this code to Xdebug. 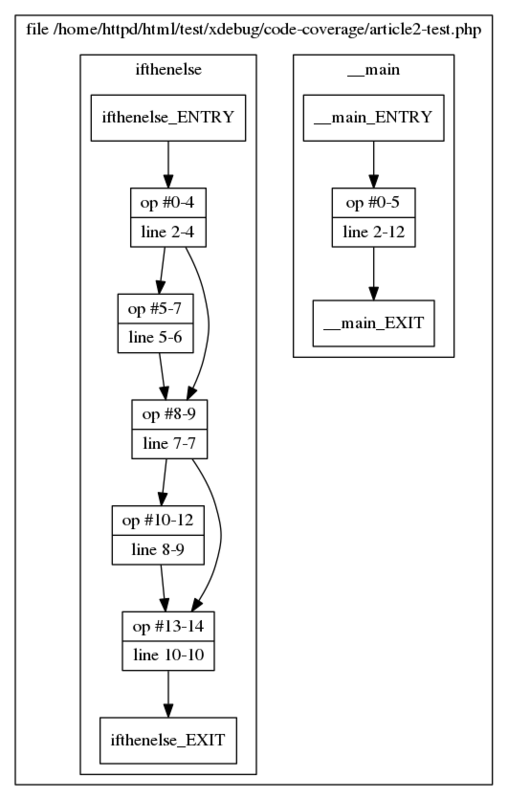 Xdebug needs to know about all the paths, but also need figure out which branches and paths are actually followed. It needs to overload every opcode (PHP's smallest execution unit) handler, as any of them could be at the start of a branch. Overloading each opcode handler makes running your code, a lot slower unfortunately when with branch/path coverage is enabled. 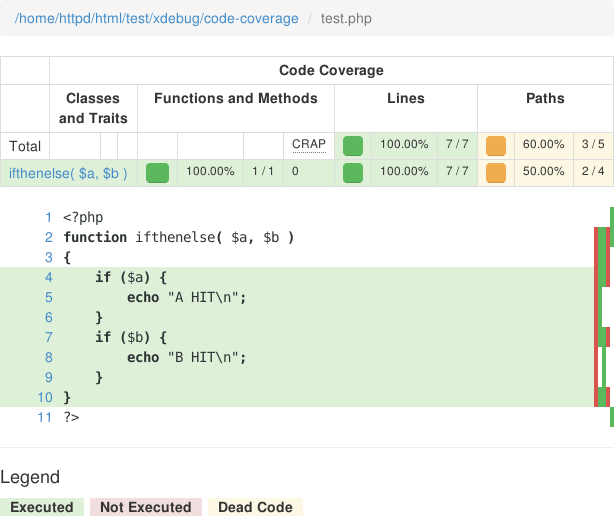 Now it's just waiting until Sebastian (or somebody else) has time to upgrade PHP_CodeCoverage to show the branch and path coverage. Happy hacking! That's a very cool change. Wishing you all the best in having it implemented. I can't wait until I have to write exponentially more tests. 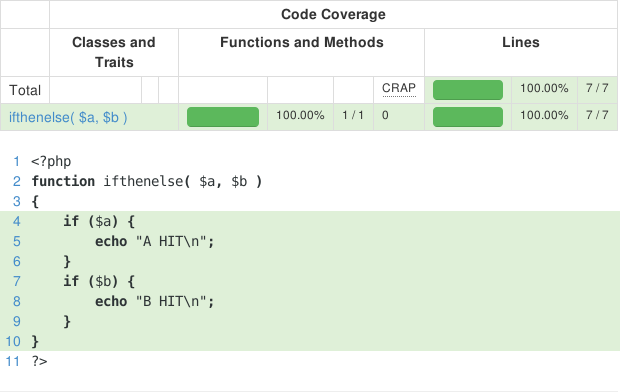 I've completed part of the task Sebastian did and this PR https://github.com/sebastianbergmann/php-code-coverage/pull/400 contains a functional branch coverage output for Text and HTML reports. I hope to complete Clover report soon.